- Fed Out of Gas! As observed in August, gold has broken out of its first gear and ratcheted into second gear back in early 2006, not long before its top for that year. Although it broke down in May of ‘06, it has steadfastly remained atop its then-established bottom trendline, which was the upper limit of the bull market’s “first gear” stage. 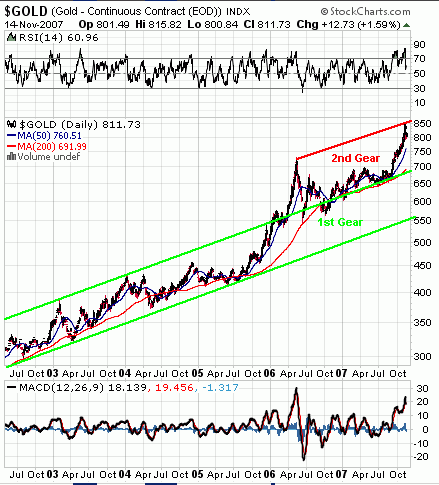 When the August “Gold Uptrend” article was published, this second gear was merely a possibility, based on the latter observation (i.e., that it never dipped significantly below its former uptrend ceiling. The recent top near $850/oz last Friday has now confirmed that formerly theoretical second gear stage as a valid second trend channel piggybacking right on top of the first gear stage. The red line in the chart below is perfectly parallel to the green trendlines encasing the “first gear” stage. It has now proven to be a level of resistance. The question now is: Will gold stay in second gear, and if so, for how long? For anyone with remaining jitters about the longevity of this ongoing gold bull (come on, now! It’s now been going on for six years. Snap out of it! ), there may be a lingering fear that the dollar-price of the lustrous metal may dip back into “first gear” again. To their comfort, gold will have a long way to go to get there, namely all the way back down to the $700 level. It is unlikely that level will be reached any time soon. Since Monday’s significant drop of nearly $30 an ounce, gold has stabilized very nicely and by Wednesday went back over the $800 level again. But that was before today, November 15th, when gold fell almost $30. Silver has likewise turned in a very nice performance and today (11-14-07) closed above the equally crucial $15 level again - like gold, only days after the correction. Oil, the HUI, and the XAU are all well below overbought levels on their own charts (and never really even entered that lofty territory to begin with, except for the briefest of times on their way up. So, all seems to be well in precious metals land. Except for what happened today. But, what happened today is not really that bad, even if it continues on Friday. In Fed territory, things look quite different, though. The Fed has lost its grip on the economy and the credit crunch. The only way it can make itself look good is by grinding and twisting economic statistics beyond all recognition so nobody can catch on to their game but, alas, 'tis too late for that. The power Congress granted the Fed rests solely upon its ability to manipulate interest rates at will. We have all been taught from the days we first actually paid attention to business and economic news that falling rates ‘help’ the economy out of tight spots. That is no longer so, it seems. Yes, the Fed can still manipulate interest rates, just as it always has. It just doesn’t have the desired effect anymore. Dropping the funds rate by 50 basis points and then again for a more moderate quarter percentage point did not stop the credit crunch. It did not help the Dow significantly higher. It did not keep any of the top financial houses from declaring multi-billion dollar write-downs, one after another, week after week, even after financial news outlets prematurely declared that "the worst is over." Dropping rates certainly didn’t help the dollar any, and the dollar’s drop has little capacity to help the economy right itself again by cranking up exports, as some contend. Although remaining US exporters are indeed having a heyday, the big question is: How many are left? The majority pf them now produce out of China, so they can’t help us anymore. In other words, the Fed may still have the ship's rudder firmly in its grasp - but the blade is detaching itself from the steering mechanism. When you’re in a car race, and you run out of gas in the middle of the track with the other drivers in the race closing in on you from behind very fast, there’s only one wise course of action: Get the heck out of the way, if you can! But of course, the Fed boys will never take a gold investor's advice. Gold can, and always could, do the Fed’s job much better than even the undeservedly revered Mr. Greenspan. In fact, gold does it too well - and in a way that will not allow the creme de la creme of the financial world to skim all of the juicy stuff off the top of the barrel and use it to nudge elected officials into appointing them to the highest offices in the land. Two US secretaries of the Treasury have come from the stable of Goldman Sachs in the past two administrations, for example. Proof of bribery or conspiracy? No. Cause for concern? Yes. So, given the fact that gold is in second gear (still three gears away from overdrive, mind you!) and given that the Fed is out of gas, Ron Paul is in the race for the white house and gaining on his detractors with lightning speed, maybe, just maybe, we will all be able to earn, save, and spend real money again before long. Who knows? And what gear will gold be in, by then? It won’t matter - because in reality, gold is not in any “gear” at all. It is the crankshaft that translates the human energy expended by you and me into accurate pricing and interest rate information - if it’s allowed to do its job, that is. But for those timid souls who still measure gold’s value in dollar-terms (how ludicrous, if you really think about it) gold stands a very good chance of shifting into third gear by the end of January, and that will bring it, oh, somewhere above $900 per ounce. Now, you are likely reading all of this one or more days after gold was hit hard and dropped roughly $30 on November 15th (and maybe will be hit again on Friday, November 16th before closing for the weekend). You may wonder why anyone would publish such a gold-bullish article in the aftermath of such carnage? Today, November 15th, the news was abuzz with ruminations that the UAE, another major oil producer, may see itself forced to go off its dollar peg and may start accepting euros or other currencies for its oil along with Kuwait, Iran, and Syria. Seven more countries, including the Saudis, South Korea, China, Venezuela, are either already working under alternate arrangements or are mulling them over at this time. The only real "backing" the dollar has as a reserve currency is the worldwide demand built in by virtue of it (still) being the major oil-trading currency. Its status as such is the final word on its value compared to other currencies. No oil, no dollar. Big finance profit-downgrades resulting from the US sub-slime mortgage debacle continue unabated around the globe. Stock markets might as well be called “shock markets” as they suffer volatile price movements in all directions while seemingly spinning out of control. There's no way gold can be allowed to shine alone like a laser beacon through this muggy mess - so a down-week had to be hastily arranged. The time was ripe. It would have happened anyway. Just a little nudge, and it got so 'bad' that enough gold investors (especially funds) were scared into giving up their paper-claims to he metal. On Kitco.com’s 24 hour chart, you will notice that gold was cruising quite comfortably in the $810 - $815 range on November 14th. It was doing just fine - until trading opened in London, that is, to where JP Morgan shifted its gold trading desk in 1999 in order to span the Atlantic with its by now well-documented gold-price-suppression schemes. Just like driving your car, investing only makes sense if you can see where you are going. The Euro vs Dollar Monitor is the golden windshield wiper that removes the media's greasy film of financial misinformation from your investment outlook. Don't drive your investment vehicle without it!